When natural gas prices dropped and dark days fell upon Southwestern Energy in 2016, Jenny McCauley was there to help steer the company in a new direction. A year later, when five leadership positions were suddenly vacant, she helped find the right people to fill them. It’s no surprise there’s very little that scares her. Jenny McCauley remembers the darkest day of her career. It was in January 2016, and Southwestern Energy, a Texas-based oil and gas exploration and production company, was preparing to reshape the company in light of the significant decline in natural gas prices. The company was built on an average $4/MMBTU model, and at best, prices were topping out around $2. Prices looked to hold at this level for the near term, resulting in the “lower for longer” view on natural gas. To thrive during this downturn, the company had to pivot. That meant shedding 40 percent of its staff in one day and halting all drilling and completing operations—two moves that, on their own, could be a show stopper for other companies. “We knew things were going to be bumpy, and failure was not an option,” says McCauley, the company’s senior vice president of administration. The company also had to recognize that leadership needed help and support to pull off a dramatic transition that would keep it afloat and lead with fortitude, confidence, and resilience. With the company’s industry in a trough, McCauley worked with the Center for Creative Leadership on a program called Leading Through Transitions that would provide training for leaders so they could help the company resume operations, as well as sustain business moving forward. The answer was to build a metaphorical bridge to bring people along, and that concept might just be what strengthened Southwestern Energy in those dark days. The Leading Through Transitions program walked leaders from the past through a “neutral zone” and ultimately to the new beginning. Effectively and efficiently working through the “neutral zone” was a large part of the focus to help leaders pivot the organization from the past to the future. The need to move through the neutral zone quickly was critical because this is where mistakes happen, safety issues arise, and people become disengaged. McCauley was pleasantly surprised to see the high levels of commitment and engagement of employees at all levels during that challenging period. 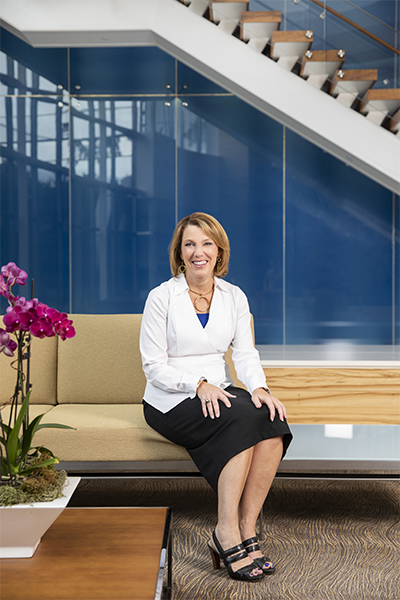 “It really was a credit to our strong culture to witness so many of our employees continuing to be creative, imaginative, and resourceful in their jobs while the company was making these big changes,” she says. While it would have been not unexpected for some employees to focus more on their own futures during this period, McCauley was impressed to see that they continued to volunteer, donate time and money, and stay very active in the communities where they lived and worked. “I believe these efforts helped the company commitment to community engagement grow even stronger during some tough times,” she says. Rebuilding credibility was another big task. The company had to shore up its balance sheet by divesting of assets and paying down debt. Once operations resumed and the strategy for the reshaped company was developed, McCauley says the strategy work revealed organizational capability needs at the top of the organization. The company had benefited from strong technical and functional talent at its highest level, and now needed more strategic, enterprise-wide, and broad executive leadership capability. McCauley says the company started searching for two new executives, a COO and an executive vice president of corporate development for its C-suite, but then another unexpected turn occurred. The company’s CFO left for another role, leaving the top three positions next to the CEO vacant. Compounding that, a change was made with one of their senior level divisions, and in addition to all that, McCauley was searching for a vice president of human resources to backfill her as the top HR leader as she transitioned to the broader role of senior vice president of administration, amounting to five senior leadership vacancies and transitions just one year after the dark days of 2016. For a company looking to hire one new executive, it is challenging and critical to make the right hire. The challenge of managing five leadership changes in a short time while you restore credibility and deliver results is almost unheard of. McCauley and the team had to ensure that they could find the talented executives who believed in the Southwestern story and wanted to be part of the future—people who would not be spooked by such significant leadership changes. The ultimate answer, it turned out, was projecting an air of confidence with strong humility, key characteristics of the Southwestern culture. The roles were filled, and while the Southwestern Energy of 2019 might look a lot different from the one of 2015, McCauley says there is a common thread that’s helped strengthen all bridges. Sure, Southwestern Energy became more disciplined and learned to deliver more value with less investment, but it led to rethinking its priorities and refining its work. While growth for growth’s sake was once what worked in the industry, McCauley says the company is now focused on economic value-oriented results. But the spirit that was there from day one still underscores everything Southwestern Energy does. She saw firsthand the spirit, emotion, and passion that pulled the company through its dark days in 2016. It’s also the reason that McCauley is still around—and isn’t afraid of whatever curveballs might come her way. “I’ll know when the day comes when I shouldn’t be doing it anymore,” she adds. “Every day I walk through the doors at Southwestern, I think about that and I feel it. It’s an internal, intuitive reaction that I know I am where I am supposed to be.